Can I play if I have never played golf before? Absolutely! One of our goals is to encourage new players to the game. Please advise when you book that you are a beginner and we can arrange to spend a little extra time with you. You can also book your first time at X-Golf Huntsville with a PGA qualified coach to go through the fundamentals of holding clubs to the basic swing. Yes, we encourage players to bring their own clubs. We do ask however, that your club faces are clean and in good condition. Can I use my own tees? No need, the simulator has its own tee built into the system…plus it collects and tees the balls automatically! Do you have club rental available? We do have club rental available for $10 per set. We have a selection of clubs for different levels of handicaps. Yes. 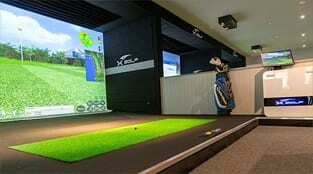 We welcome children of all ages until 9 P.M.
How long does it take to play 18 Holes on an X-Golf simulator? Generally it takes an hour for an individual player to play 18 holes. If you have more than one player you may want to book an additional hour for each player in your group, but skill level can have an effect on the time of play. Should I book a tee time? We frequently sell out during busy times/weekends and recommend booking your tee time online in order to secure one of our six X-Golf simulators. Alternatively give us a call @ (256) 715-8785.